“Traditional Turkish Peshtemal’s are the shining star of the summer, why not they be for the winter?” we asked ourselves while creating our hippest Peshtemal Blanket and Bathrobe line. We have a Peshtemal for every season, so this way you won’t have to say goodbye to your handy friends even for a couple of months. Decorate your home & hotel bathrooms with one of our most durable & soft peshtemal designs, Ocean Peshtemal! To create a complete look and style, here we are to introduce you our perfectly and harmonizingly combined Turkish Towel Set Winter Edition. For this specific set, we have chosen to bring Ocean Blanket & Ocean Bathrobe together and for the finish, we thought it would be sweet to add Ocean Turkish Towel. We know the struggle to create a whole, complete look while decorating and sometimes looks are all that matters, whether you are decorating your home or the hotel you own. And we are saying, with just little touches, without spending tons of money, it is possible to create a rich, serene, modern and a stylish outlook. You just need our cozy&comfy Turkish Towel Set Winter Edition: Ocean. Let’s take a closer look at them! Ocean Blanket will keep you warm while it keeps your bedroom chic! When we were designing the premium quality Ocean Blanket we went with the ocean patterns as we did on our Ocean Peshtemal. Ocean line is designed to represent the waves and the relaxing nature of the Ocean. We have chosen our color palette to complete that theme yet we added additional colors to appeal to everyone’s taste. You might wonder why would someone want a Blanket? 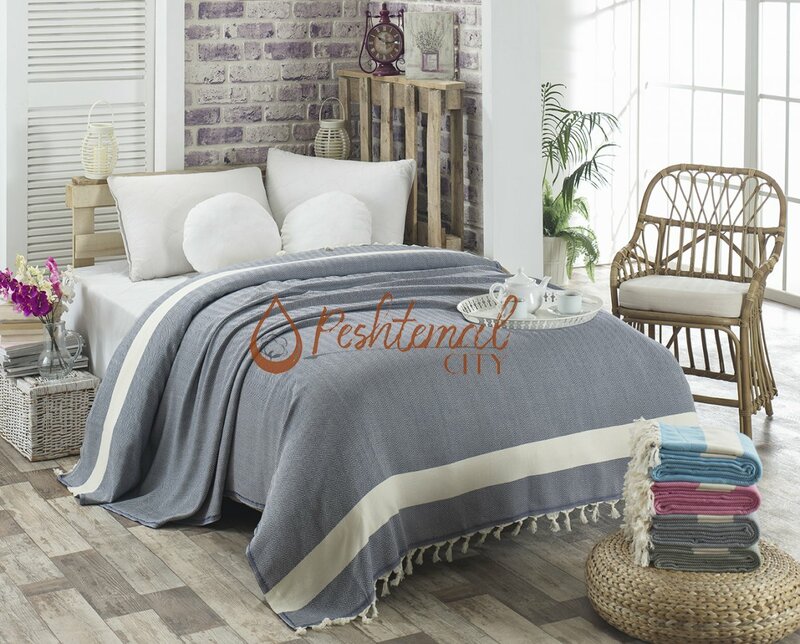 As you all know Turkish Towels are famous for being the top quality & softest towels in the market and it is no different with our Ocean Blanket. In the freezing cold winter nights, who wouldn’t want to get lost under the softest and coziest blanket? I know I do. 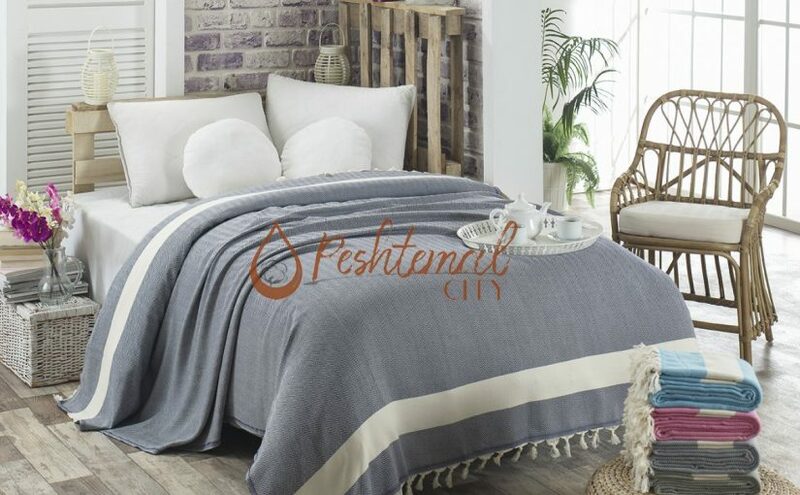 Besides being soft and durable our peshtemal blankets are easier to wash and dry compared to old-fashioned heavy and fuzzy blankets which hold dirt, hair, and dust and in the end becomes a nightmare to clean plus starts to smell. With its smooth and fuzz-free surface, it is a dream blanket come true. Decorated with a white line at both ends, it will help you to create a modern and minimalistic look. We haven’t forgotten to ornament our Ocean Peshtemal with our typical white fringes at the ends. Woven 100% from premium quality Turkish cotton, Ocean Blanket will add coziness and warmth to your home or hotel bedrooms. Having a size of 200×240 cm and a weight of 1100 grams it can be used both in one-sized and double sized beds. Learn more about one of our top-selling peshtemal bathrobes in Ocean Blanket Product page. Ocean Bathrobe is one of our top-selling luxurious peshtemal bathrobe designs. The perfect match to Ocean Blanket is the Ocean Bathrobe of course. Who could have imagined a winter without a cozy blanket and a comfy bathrobe? This is the season for hot showers and the high time to be hugged by a premium quality, soft Peshtemal Bathrobe. After all, what is the point of wearing a Peshtemal Bathrobe if you are not gonna feel chic and comfy at the same time? Being highly absorbent, Ocean Bathrobe is also quick to dry, making it the healthiest, bacteria and mold-free bathrobe in the market. This elegant Peshtemal Bathrobe is woven 100% from Turkish cotton. Woven with ring spun yarns, it is extremely durable, soft and smooth. Comes in S – M – L – XL – XXL sizes, manufactured to fit everyone and offers you an elegant quality and look. Learn more about our luxurious peshtemal bathrobe designs on Ocean Bathrobe product page. To complete this Winter Edition Set we recommend you to take a look at Ocean Peshtemal. 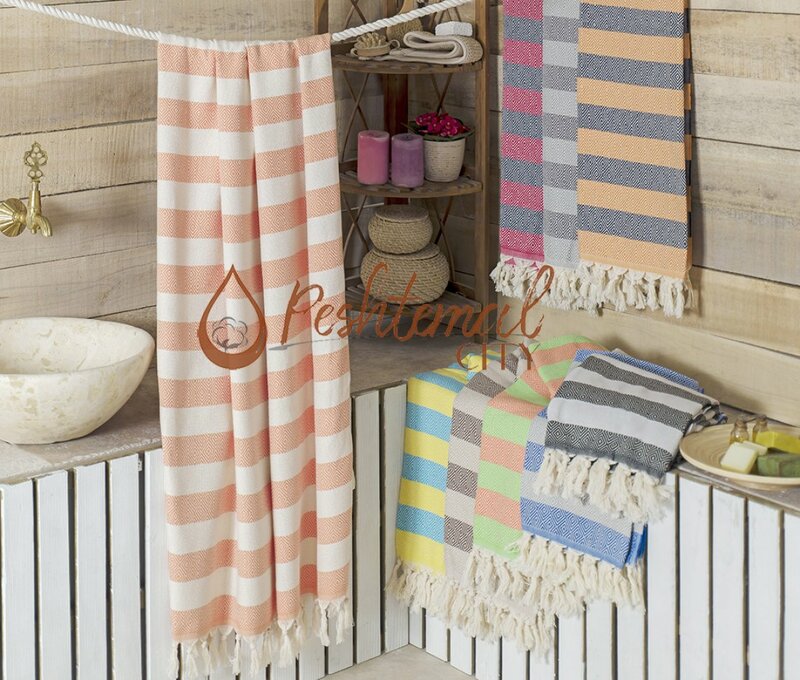 You can read our “Premium Quality Hammam Towels” article on which we’ve reviewed Ocean Peshtemal. You can also check Ocean Peshtemal Product page for more detailed information to complete your Winter Set. 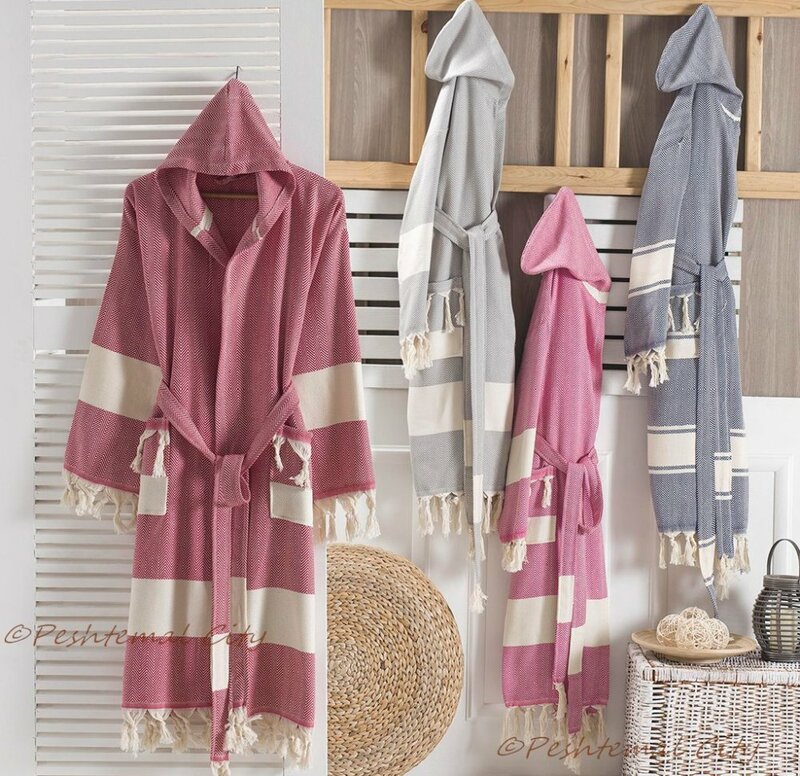 Contact us now for your Turkish towel, peshtemal bathrobe, and blanket wholesale needs and don’t miss the Winter 2018 discounts! We’ve given useful tips on keeping your customers happy with promotional Turkish towels in last week’s article for country club & gym owners. We’ve also mentioned how hotel owners can keep their customers cozy and happy with our elegant Turkish towel designs. This week’s artcile will be an addition to those articles. We’ll be reviewing 3 of our top-selling hammam towels: Diamond Stripe Peshtemal, Double Diamond Peshtemal, and Sultan Silver Peshtemal. Those 3 hammam towels will definitely keep your customers happy with their elegant designs and comfortable textures. 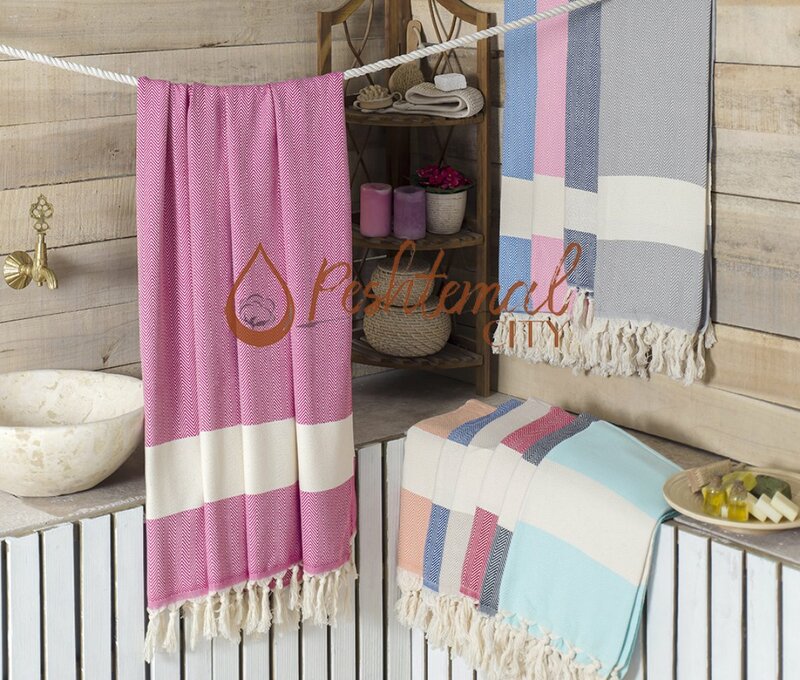 Double Diamond Peshtemal is one of our top-selling hammam towel designs! Keep your customers happy with its elegant design & comfortable texture. Double Diamond Peshtemal is one of the most preferred peshtemal designs in the entire market. It’s premium quality texture is as flawless as perfect diamonds. Woven 100% from hand-picked Turkish cotton, Double Diamond Peshtemal is highly absorbent, quick-drying, soft and durable. It weighs only 430 grams and has a size of 100×180 centimeters. 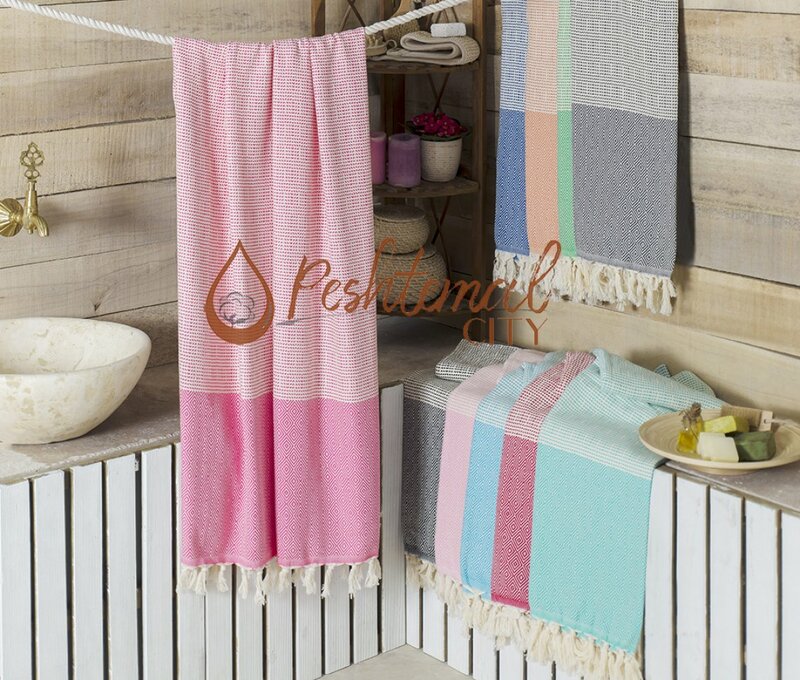 Double Diamond Peshtemal is a traditional hammam towel design. It has perfect diamond shapes combined with colorful and white blocks, completed with fringes swinging on both ends. We offer a wide color spectrum for one of our top-selling traditional hammam towel designs. You can keep every type of customer with the variety of color options we offer! Its comfortable texture combined with its elegant design make Double Diamond Peshtemal perfect for everyday use. As it is durable as diamonds, your customers will remember you happily with every use! To learn more about one of our top-selling traditional hammam towel designs visit Double Diamond Peshtemal product page! 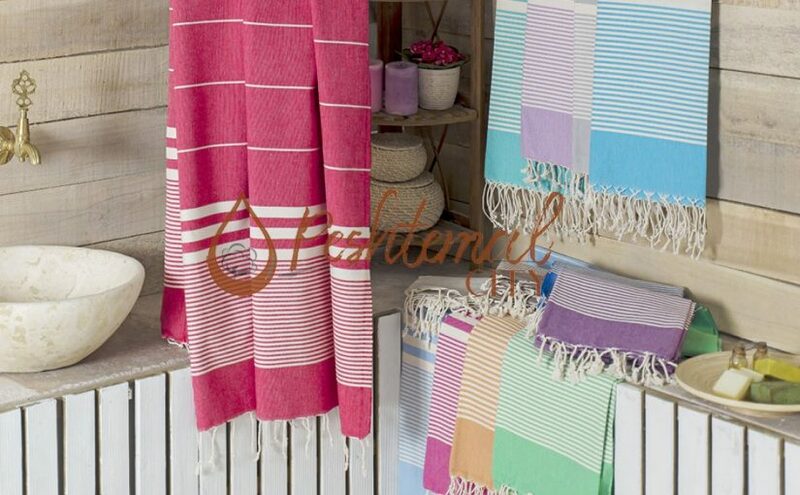 Diamond Stripe Peshtemal is an eye-catching & premium quality Fouta towel. Your customers will remember you happily with every use. Diamond Stripe Peshtemal has the same size & weight with Double Diamond Peshtemal. It weighs only 430 grams & has a size of 100×180 centimeters. Woven 100% from premium quality Turkish cotton, Diamond Stripe Peshtemal is as absorbent, quick-drying, soft, and durable as Double Diamond Peshtemal. We’ve combined one of the most traditional aspects of Fouta towels, stripes, with perfect diamond shapes on Diamond Stripe Peshtemal. And enhanced its beauty with vibrant and lively colors. You can pick the colors your customers would love within the wide color spectrum we offer for Diamond Stripe Peshtemal. You can easily learn more about one of our most elegant Fouta towel designs on Diamond Stripe Peshtemal product page! Sultan Silver Peshtemal is a perfect decorative item for dark-colored bathrooms! Sultan Silver Peshtemal is the younger brother of one of our most preferred traditional hammam towel designs: Sultan Peshtemal. They both have traditional striped designs, dyed with warm colors and garnished with fringes. The distinctive feautre is the color of their stripes. Sultan Silver Peshtemal has silver stripes while Sultan Peshtemal has white ones. Sultan Peshtemal is a better decorative item for light-colored bathrooms while Sultan Silver Peshtemal stands out in darker-colored bathrooms. Woven 100% from hand-picked Turkish cotton, Sultan Silver Peshtemal is a premium quality Turkish towel. It’s highly absorbent, extremely quick-drying, soft, and durable. It is a feather-weight Turkish towel. It weighs only 260 grams and has a size of 100×180 centimeters! Not only a perfect decorative Turkish towel, it is also perfect for travelling. Its utilizable texture and outstanding design will make your customers remember with joy! To learn more about one of our most comfortable Turkish towel designs visit Sultan Silver Peshtemal product page. Before we finish our article, we want to mention a couple of important things. We suggest you follow our Instagram, Facebook, Google+, and Twitter accounts to keep updated about our latest products & articles. We also suggest you visit our “products page” to discover our entire collection with ease! Please don’t hesitate to “contact us” for your peshtemal wholesale needs or any questions about our peshtemal designs! 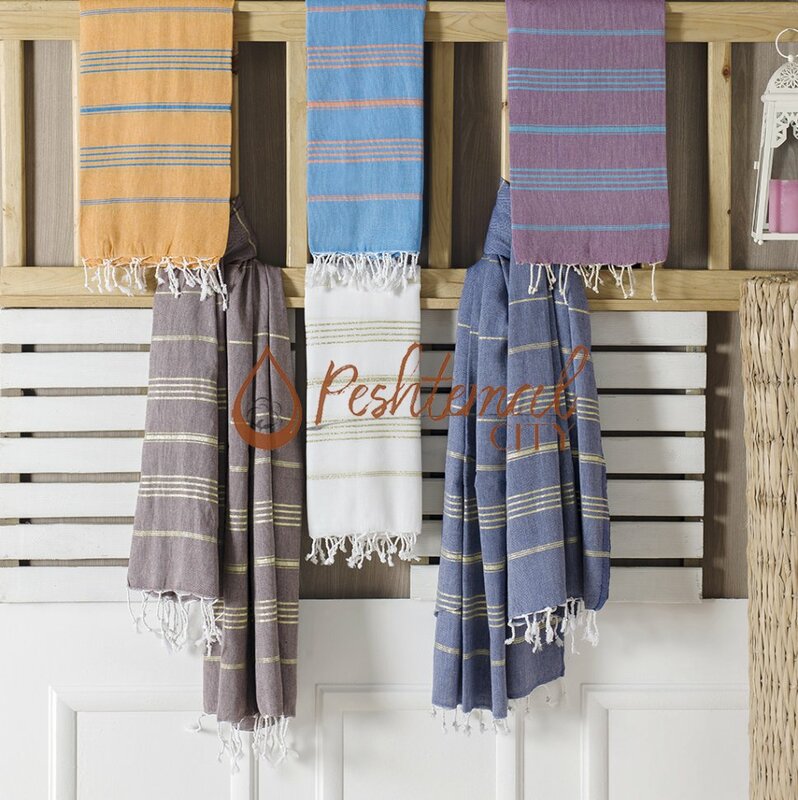 As a peshtemal manufacturerr & wholesaler we hope that our articles are helpful for you. We would apriciate any feedback from you. We wish you a happy Autumn 2018!